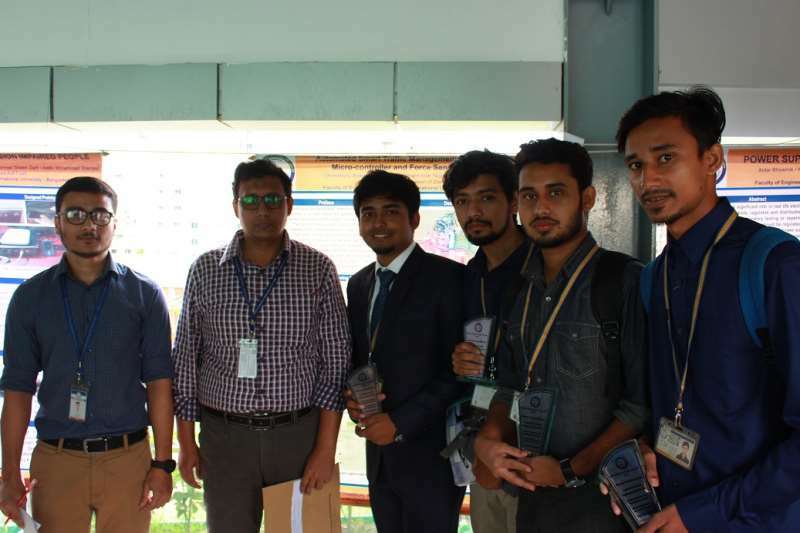 On 30thApril, 2018, AIUB Community of Engineering Students (ACES) organized the Final Defence Program for the semester Spring 2017-18 titled “Celebration of Project and Thesis Completion” of EEE and CoE Department. 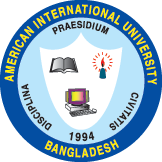 This remarkable event took place at the Campus of American International University-Bangladesh (AIUB), on the first floor of the lobby between Annex 2 and 3. The event was supported by the faculty members of EEE & CoE department. There was a total of 41 groups who defended their project in front their respective supervisors, external supervisors and other faculties. Afterwards, the celebration program started. 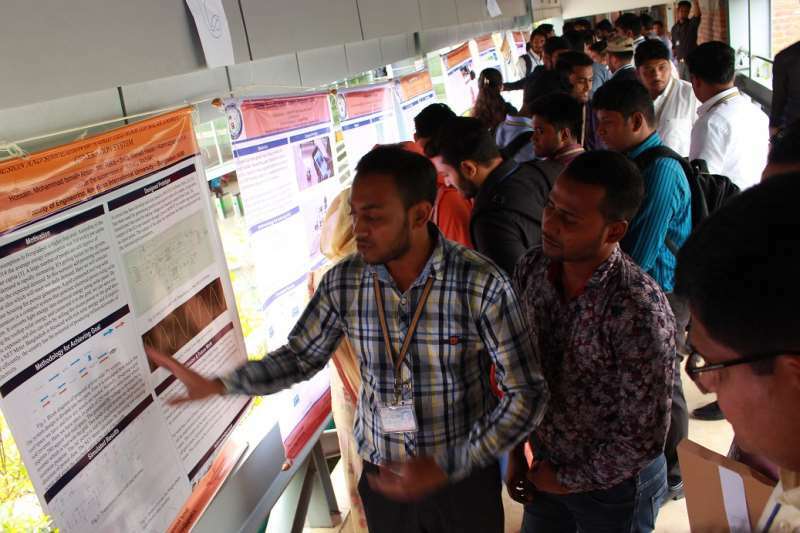 The groups those who defended successfully participated in the poster competition where they had to explain their project to the honourable judges. Every participant was presented a crest as an acknowledgement of their successful completion of project & thesis. The vibrancy of the whole program was escalated by the participation of the students of Department of EEE & CoE, general members and committee members of ACES in the cultural program & the viewers were exhilarated by the amazing song and dance performances. 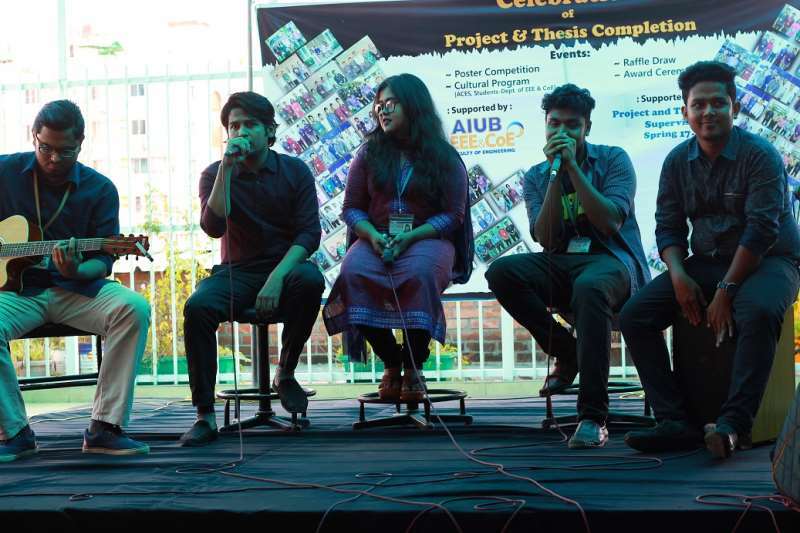 In addition, there was also a unique interactive segment, where participants were encouraged to share their memories of their time in AIUB. After that, there was a speech by Prof. Dr. A.B.M Siddique Hossain (Dean, Faculty of Engineering, AIUB) where he thanked ACES for organizing such a splendid event. 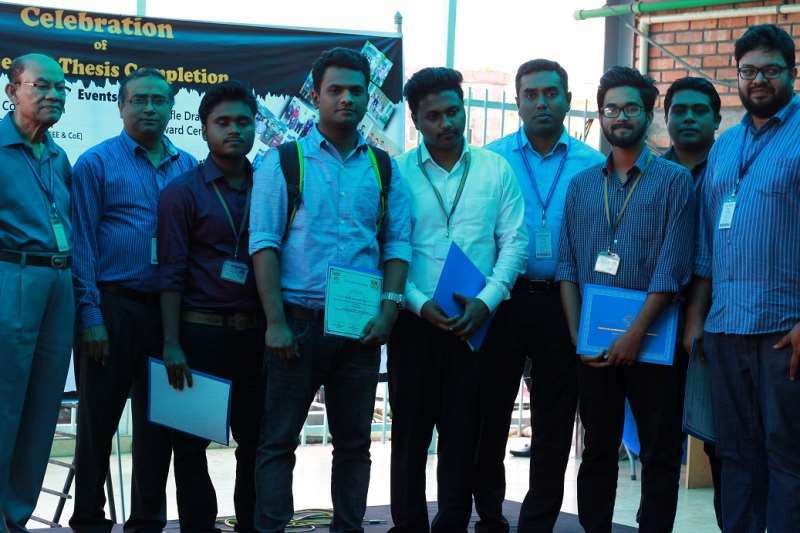 He then congratulated the groups on their successful completion of the project/thesis and encouraged the students to come up with innovative ideas and submit their papers to national & global journals and conferences in order to spread their ideas. Moreover, he also emphasised on the importance of enhancing the communication and presentation skills since it will give students an extra edge in this competitive world. Afterwards, Prof. Dr. A.B.M Siddique Hossain (Advisor, ACES; Dean, Faculty of Engineering, AIUB), Prof. Dr. Md. 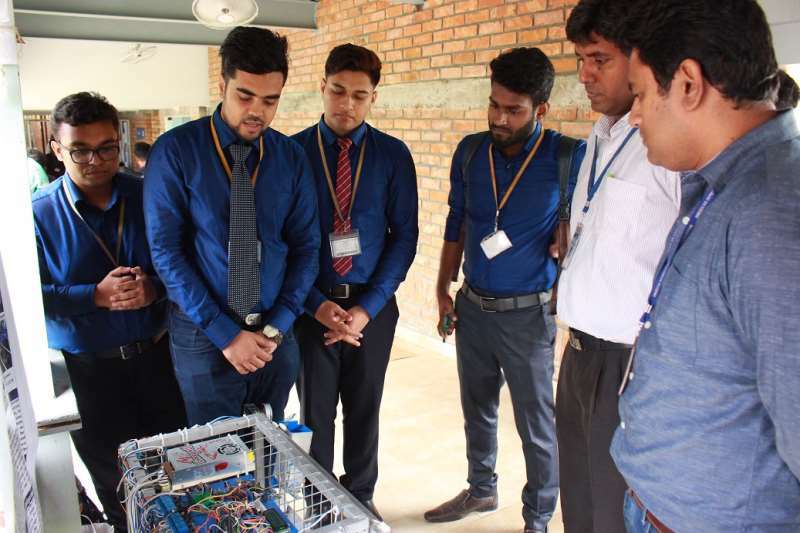 Abdur Rahman (Advisor, ACES; Director, Faculty of Engineering), Prof. Dr. Md. Abdul Mannan (Head of Undergraduate Program, Faculty of Engineering, AIUB) and Md. 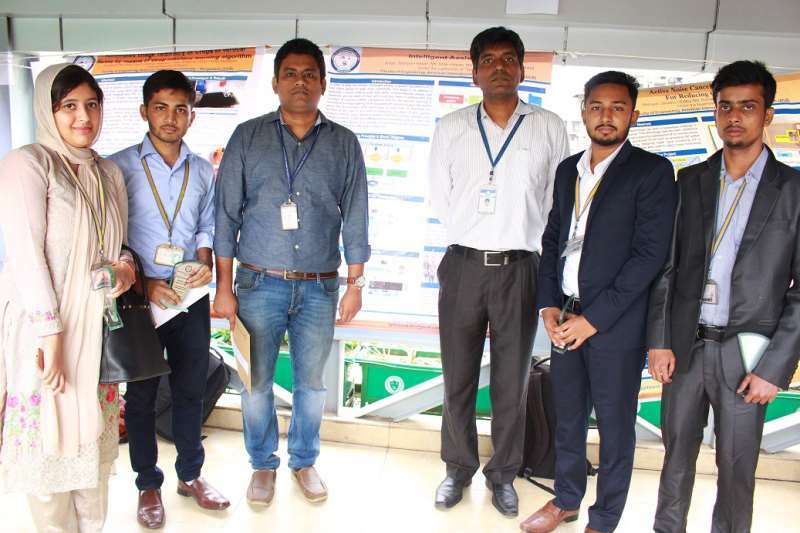 Saniat Rahman Zishan (Mentor, ACES; Senior Assistant Professor, Faculty of Engineering & Special Assistant, OSA, AIUB) presented Deans Award to the 2nd to 9th placeholders for Best Project of Convocation Year 2017-18 semester and certificate of acknowledgement to top-3 placeholders of this semester’s poster competition. In the closing part of the event, Prof. Dr. Md. Abdur Rahman announced the candidates of Spring 2017-2018 semester for the Vice Chancellor’s award for the convocation year 2017-18. He congratulated the students for their hard work and conversed about how AIUB trains their students for tough challenges, to prepare them for building a great career pathway. Thereupon, he welcomed two guests from Grameenphone Limited Mr. Azfar Adib and Mr. Jahangir Kaiser on stage, who congratulated the students on their success and discussed about the benefits of a successful implantation of their projects, believing it to have a great impact on Bangladesh in near future. Finally, Prof. Dr. Md. Abdur Rahman ended the event by thanking all the participants for successfully presenting their projects and praised ACES for brilliantly organizing this event and faculty members of department of EEE & CoE for their profound support. 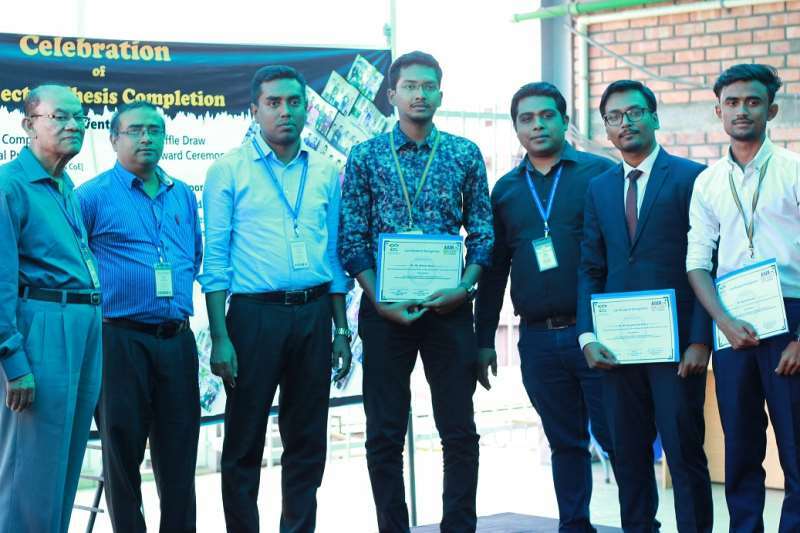 Dr. M. Tanseer Ali (Senior Assistant Professor, Faculty of Engineering, AIUB), Ms. Nadia Nowshin (Assistant Professor, Faculty of Engineering, AIUB), Mr. Ahmed Mortuza Saleque (Assistant Professor, Faculty of Engineering, AIUB), Mr. Abu Hena Md. Shatil (Assistant Professor, Faculty of Engineering, AIUB), Mr. Md. Nahian - Al - Subri Ivan (Assistant Professor, Faculty of Engineering, AIUB), Mr. Kawshik Shikder (Lecturer, Faculty of Engineering, AIUB), Mr. Md. Arif Abdulla Samy (Assistant Professor, Faculty of Engineering, AIUB), Mr. Kazi Ahmed Asif Fuad (Lecturer, Faculty of Engineering AIUB), Ms. Sumaiya Umme Hani (Senior Lecturer, Faculty of Engineering, AIUB & Motivator of ACES), and Mr. Safayet Ahmed (Motivator, ACES; Lecturer, Faculty of Engineering, AIUB) graced the ceremony with their presence. The entire event was a huge success due to enormous support from the project & thesis supervisors and external supervisors of the EEE & CoE department.